Somehow I forgot to take pictures of these cards before I mailed them in. 😕 So I apologize for the quality of the pics, I just snapped pictures from the magazine – but you can order your very own copy of Take Ten Summer 2018 here. This adorable hippo is from the Happy Hippos stamp set by MFT Stamps. They also have a Happy Hippos die set to go with the stamps! The stamps I used on the 2 cards below (except the “thinking of you”) are from the Hello Birdie stamp set by Unity Stamp Company. The “thinking of you” stamp is an older stamp from Savvy Stamps. I used this Dots Embossing Folder for the orange strip of card stock on the card above. The other 3 folders are from Stampin’ Up – the Quilt one is available here, but the other 2 are discontinued – just use your favorites to create your own background. 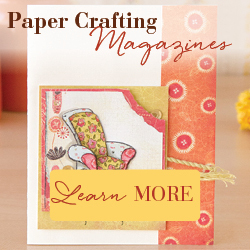 It’s so fun to have my cards published in my favorite magazine! If you’re looking for a magazine with tons of inspiration, check out Take Ten Magazine. I don’t think you’ll be disappointed! !